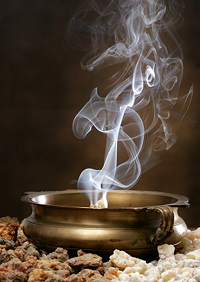 At any time during a Sage & Smudge ritual, you may want to include a Personal Energy Clearing for yourself. Or, you may want to specifically create your own personal energy balancing and clearing ceremonies, ones you practice on a regular basis. Some people carry out this type of Personal Clearing ceremony daily or on a very regular basis. You can successfully clear any negative energy that you may have come in contact with, and easily carry out your own energy balancing and clearing ceremonies. Think about situations that cause you stress or discomfort, times you spend in challenging or uncomfortable environments, or with others who drain your energy. When you have identified common personal energy-draining situations, you will know when you might wish to work with this sage and smudge technique. To begin your own ceremony, create a positive affirmation, or a mental image of a safe and nurturing environment. You may want to write down your thoughts in your Sage and Smudge journal. Gather your sage and smudge tools, hold your wand or stick in your non-dominant hand, or place your chosen dried herbs in a suitable vessel. Light your smudge in your preferred manner as you begin your clearing and healing meditation. Watch the smoke rise or drift towards (or away from) you for a moment. Then breathe in the essence of the sacred smoke herbs, and focus on yourself and your body for a moment. Notice any particular areas that need your attention. Then bend and use your wand or the feather (if your smudge is burning in a vessel) to move the smoke down as far as possible, to your ankles and feet. Move the smoke from that position near the floor, slowly up the length of your body to the top of your head, pausing briefly now and again to focus on your affirmation or mental image. This helps to cleanse your aura of any disturbances or negative energy you may have experienced that day. Finish your Personal Energy Clearing, holding the wand or the feather in front of you at the level of your heart, and watch the sacred smoke rising up. Repeat any affirmations, include any visualizations for your own well-being and spiritual purpose. Breathe again deeply, and then complete the ritual.